One of the common mistakes we hear when talking with our customers is the pronunciation of our company’s name “SUMURI”. It is often confused frequently with the word “Samurai” which refers to the legendary Japanese warrior of old. The word “SUMURI” is also derived from an Asian word, but it is not Japanese, it is Tagalog (Filipino language) which means to “investigate” or “analyze”. SUMURI was founded by Steve and Ailyn Whalen in 2010. Ailyn serves as SUMURI’s president and was born and lived in the Philippines until 2009 when she moved to the US. 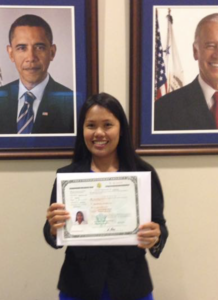 In 2016, Ailyn was excited to become a US citizen, however, she retains and promotes the welcoming culture and positive values of the Philippines with our team members and our customers. As they say in the Philippines, the first time you meet you are friends, the second time, you are family. During her time in the Philippines Ailyn took a variety of computer classes. In the US, prior to co-founding SUMURI, Ailyn assisted behind the scenes with another digital forensic company where Steve was a partner. 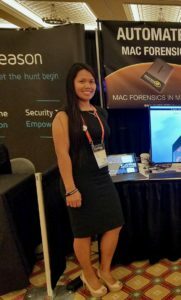 During that time Ailyn quickly learned a lot about digital forensics and the digital forensic community. In 2010, SUMURI started with Ailyn and Steve as the only two employees where she became involved in every aspect of the company. Over the years SUMURI has grown by leaps and bounds. Ailyn is responsible for directing the company and its affairs and is responsible for ensuring that SUMURI’s goals and objectives are met. Ailyn is also responsible for implementation of policies and procedures. During a typical day Ailyn meets with SUMURI’s CEO, directors and managers to discuss current and future projects, oversees quality of production, meets and interviews new team members, refines polices and procedures and more. It’s the “more” that makes Ailyn a very special president. During the day Ailyn also goes out of her way to assist any team member with their tasks and is quick to celebrate a special event or a special occasion for our team members. Ailyn is not the only member of the SUMURI team whose roots originate in the Philippines. 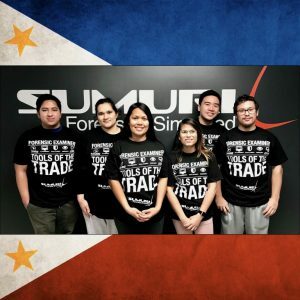 Currently, SUMURI is excited to have five of its team members who are also Filipino and a part of an extremely diversified company!